Like many of us, SpaWatcher thinks "sauna" and "Sweden" are words joined at the hip. But after a visit to Stockholm's sleek Sturebadet, she now thinks Sweden and "Sami Zen" is an even better match. The Sami, nomadic indigenous people of the Arctic Circle, knew how to spa before the term was invented, using heated "bote" healing stones to draw out negative energy or discomfort, and native plants and oils for well-being as they roamed. SpaWatcher knows all this because she is in a replica of a teepee-like Sami tent, with rough-wood walls and artificial stars twinkling overhead, a candlelit space constructed within the Sturebadet especially for this spirit-of-place treatment. Tradition-rich, the 80-minute Sami Zen begins with an exfoliating salt scrub with essential oils, then segues into a 15-minute soak in the tent's huge wooden tub, filled with mineral-rich warm water and chamomile bath bubbles. A facial with Kerstin Florian products and warm stones is next, followed by a full-body hot stone massage using warmed birch bud oil, beloved of the Sami for its antibacterial properties. As if this weren't relaxing enough, Jojk music, a modern form of Sami traditional "from the heart" songs, at once calming and otherworldly, plays softly throughout the treatment. The total effect is a relaxing journey to another world in the middle of one of the world's most contemporary cities. Sturebadet itself is Stockholm's oldest, largest, and most exclusive spa, founded in 1885. 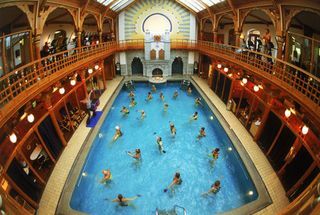 The current facility dates from 1989, and while tucked into a glitzy shopping mall, is an oasis of tile and light wood, sporting everything from hydrotherapy circuits, saunas (natch), and a chic caf‚ to an elaborately tiled Art Deco/Moorish indoor swimming pool. The treatment menu is extensive, from basic Swedish massage to the latest therapies but, for my money, the Sami Zen is the best way to meld treatment and tradition in a singular setting. Skoal!